Vancouver is known as the City of Glass, a nickname earned from famous local author Douglas Coupland, reflectng the primarily steel-and-glass aesthetic of downtown buildings. One look at the city skyline and it’s easy to spot the mirrored condos that tower over the city. However, upon further inspection, and perhaps a little closer to the ground, are buildings renowned for their history and beauty. 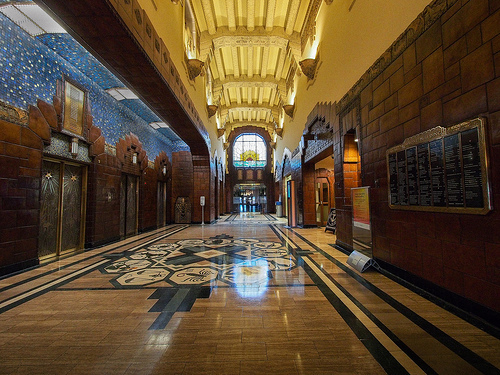 Uncover the unknown past while walking historic hallways built at the turn of the century. Get your morning caffeine fix at the location of local coffee shop J.J. Bean inside the iconic Marine Building. A product of the prosperous 1920s era in Vancouver, it was slated to be the tallest office building in the city and closely associated to the growing shipping industry that was booming in the area we now call Canada Place. 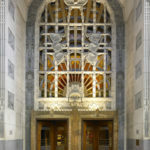 Construction took place from 1929 – 1930, and reflects a classic Art Deco style which includes heavily ornamented brick curtain walls and extensive use of terracotta trim. The original building developer was a former rum-runner who lost his wealth during the Great Depression. The building was sold to the Guinness family (of beer fame) in 1933. After a morning cup of java, stroll towards Stanley Park for a Talking Tree Tour with Talasay Tours. 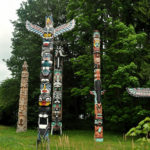 Their Indigenous Walk is a bit of a departure from historic (indoor) hallways, but the trees and totem poles found along the pathways in Stanley Park tell a special story of British Columbia from long ago, having been brought to the area in the 1920s and 1930s. Totem poles were – and are – considered to be signature symbols of Canadian identity. The first poles were brought in from Alert Bay with others coming from Haida Gwaii and Rivers Inlet. Today the totem poles are replicas. Originals have been sent to museums for preservation or returned to their places of origin. However, they remain one of Vancouver’s top attractions. Experience nightlife in Vancouver in a whole new way. 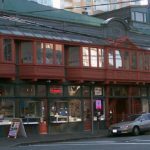 Although clubs and bars line the Granville Street strip, so too do a handful of historic theatres and buildings. Step into one of the crown jewels, the Orpheum Theatre, considered to be the “Grand Old Lady of Granville.” Designed in the mid-1920s, it was considered the largest and most extravagant theatre on the Pacific Coast. It was built in the Second Renaissance style which highlights symmetry, proportion and geometry. The grand curves, arches and domes inside are set against brilliant red fabrics – a more modern design element. The Orpheum Theatre is one of a few “movie palaces” (of the 17 built across Canada) to survive in relatively unchanged condition. 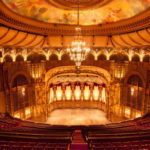 Today it is home to the Vancouver Symphony Orchestra but welcomes performances throughout the year from various local and travelling companies. Built in 1910, the Dominion Building was once the highest building in the British Empire. The 13-story skyscraper stands at a (once considered) whopping 147.5 feet tall. Now dwarfed by the likes of downtown hotels and condos, the steel-framed, Chicago-style building has Beaux Arts details, such as classical columns, arched windows, terracotta colour and a Second Empire-style curved mansard roof. The interior features a unique design element for the era – a central lobby with a spiral staircase. This staircase was key to it’s early undoing – the building failed to get tenants because the interior staircase proved inefficient in terms of office space. Today, there are indeed offices residing in the tower, and visitors can descend into its lowest level for a delicious lunch at the Middle-Eastern influenced restaurant, Nuba. Vancouver’s Chinatown neighbourhood is brimming with history and culture, including architecturally significant components of the city’s Chinese history. Peruse the businesses and shops of the area while taking in classic Chinese architecture. Although visitors may not need to shop for insurance, the Sam Kee Building has a story that must be told. Now home to Jack Chow Insurance, the building was built in 1913 as an act of defiance. The building once held the world record for thinnest freestanding building in the world with a base that hits its widest point at a whopping 6 foot 2 inches (1.8 metres). At the turn of the century, the City of Vancouver made a decision to widen a nearby road resulting in a large portion of owner Chang Toy’s property being reclaimed by the City. Instead of selling his remaining few feet, he decided to build a three-story commercial property. 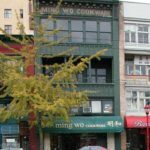 A little further down the street is a more classic Chinatown architectural style; the Ming Wo Building. Now a popular houseware chain of the same name, the Ming Wo Building was completed in 1913 and features a classic four-story design with one or more upper floors having a recessed balcony, designed to accommodate “married bachelors” who often worked in the retail space on the first floor. Not to be confused with lunch at the Dominion Building, the Dominion Hotel is the place for a final dinner and a drink as the weekend of historic hallways comes to a close. 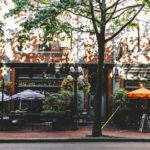 Tuck in at the Lamplighter Pub for classic pub fare while enjoying the architecture of this Gastown landmark. 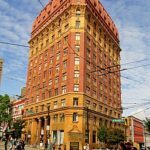 In a neighbourhood where all the buildings, streets, statues, and alleys have a story to tell, the Dominion Hotel was one of the first hotels built in Gastown and was the first establishment to receive a pub license in 1925. The exterior is a strong example of late Victorian Italianate style which dates back to the end of the Victorian era. Architectural aficionados will also notice early Romanesque Revival stylings reflected in the repetitive use of round-headed window openings. Time travel from the turn of the century to mid-century modern with a look at our Vintage Vancouver Itinerary. When you’re ready for a good night’s rest, step into our retro-chic rooms! Visit our booking page for the best rates since sliced bread. *Facts for this article were largely obtained via the Vancouver Heritage Foundation website. For information on other historic buildings and an interactive map, click here.